The May 9 Philippine Elections are over. The national and local elections in the Philippines have ended. It is generally conducted in the peaceful, clean and orderly manner with the isolated election--related incidences of harassment, killing and cheating. It is almost done in 24-hour. Unlike previous elections. These elections are worthy and deserving. Election-related incidences like killing, cheating are isolated. They are generally peaceful, clean and orderly. The people want a change in the government. And now they have spoken and they have it in this May 9 elections. They give Duterte an overwhelming 15 million votes. 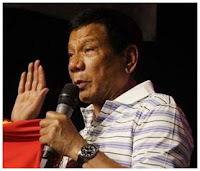 The most controversial president-elect Duterte is duty-bound now to effect this change which the people want for they are dismayed by the performance of PNoy Aquino's administration as they aired it over the social media. Duterte as called by some of his critics as "Mayor of the Philippines" discloses to be sober and serious for the discharge of duties and responsibilities as the chief executive of the country in a press conference. He has already signified of his plans for the first 100 days of office. These plans may include the reorganization of the cabinet members, a national liquor ban, curfew for minors, among others. Rodrigo "Rody" R. Duterte, "tough-talking" Davao Mayor was the president-elect. He was overwhelmingly elected by 54 million registered Filipino voters against administration bet, Mar Roxas. He bested the other 4 presidential bets like VP Jejomar Binay, Senator Grace Poe, DILG Secretary Mar Roxas, and Senator Miriam Defensor-Santiago. Senator Poe and Secretary Roxas have already conceded to Duterte in a press conference. VP Binay manifested a support to Duterte. Senator Santiago has remained silent as of this writing. Leni Robredo was edging in the vice presidential race after garnering a very tight margin of votes against Bongbong Marcos, the son of the late Ferdinand Marcos, former President of the Philippines.